How it can be used effectively and how to design for conversions. Social Marketing and ORM (online reputation management). Blogging Benefits, which also touched on SEO (search engine optimisation) and strategies. eCommerce, how to launch an eCommerce site and manage it to acquire leads and convert to customers. Pay-Per-Click Advertising and how to use this tool to generate the right leads for your business. Search Engine Optimisation, how to utilise this to acquire leads in the long term. Email Marketing, how to implement and manage it, pitfalls on things to avoid and an overview on tools that can help. Data Driven Marketing and Sales for Maximum Return. Will this Digital Marketing qualification expand my services? Of course! I am confident this qualification will prove invaluable to my customers, adding even more value to their businesses. I already provide SEO content writing, which helps to increase visibility of a website and drive more traffic. But now, I can provide help and assistance with social media marketing, online reputation management, affiliate marketing, pay-per-click advertising and much much more. Therefore providing well-rounded digital marketing services. I am now in the process of completing an advanced qualification, along with an advanced qualification in social media marketing. Therefore, I am eager to begin providing fully inclusive social media marketing services and online reputation management. Qualification gained with Shaw Academy. 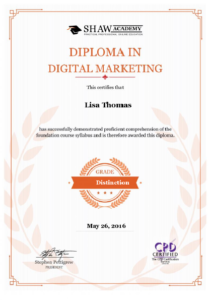 Why complete a Digital Marketing qualification? I took this course because my business clients were requesting services which required a strong understanding of digital marketing. Though I was able to teach myself the fundamentals which enabled me to complete the orders placed I realised that requests for digital marketing related services were becoming more frequent therefore, this was an area I needed to have a much firmer grasp of. This therefore motivated me to complete a Diploma, where I attended webinars and completed assessments and assignments throughout the course. Tell me what services you want, as well as how can I help your business. What can you do yourself, but what do you need help with? How do you monitor and measure your online digital presence, moreover which areas do you struggle with? I completed this diploma to better serve my customers, therefore your feedback is invaluable to me. Leave a comment below to share your thoughts, or message me directly.